What are they feeding you, car? You have leaded gas! On Saturday, I was trying to entertain Toph for a bit and we got into a drawing competition to see who could draw what in one minute. We both drew cars, and the car I made resembled this one. When Toph saw the exhaust, he called thought that the car had gas. I took the idea to this a silly extreme and I know he’ll enjoy it. 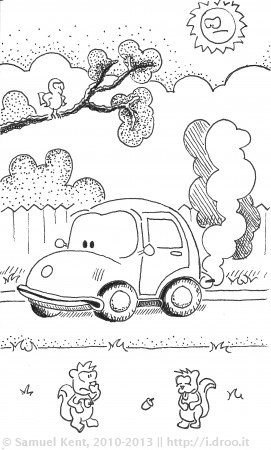 Author’s note: This doodle gets a TON of traffic from Google for people searching for “air pollution drawing competition” and similar. If you’re interested in using this picture for educational purposes, or if you want some guidance on how to draw air pollution, feel free to contact me!